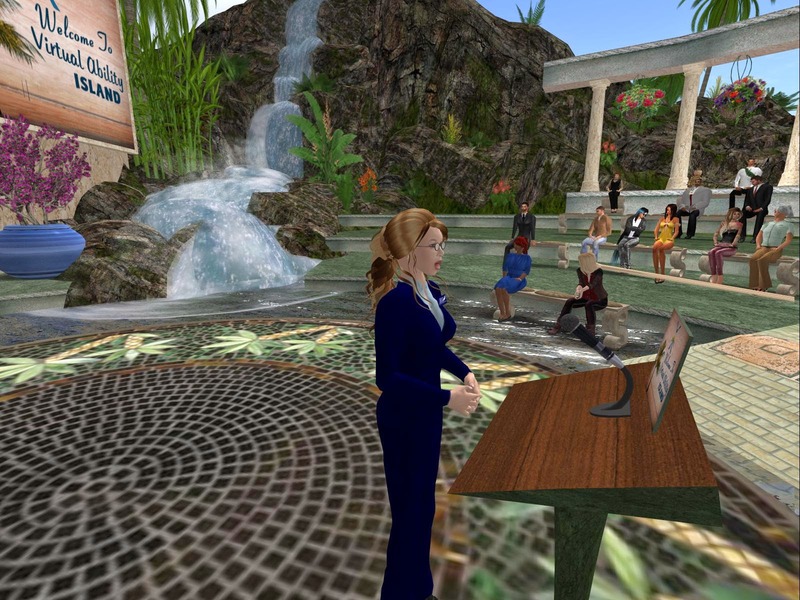 Virtual Ability, Inc. welcomes guest blogger Nicole Matyas, OTS, as she shares her thoughts about the session entitled “Employment Equality Through Accommodation and Self-Advocacy,” presented by Teresa Goddard, Senior Consultant with the Job Accommodation Network at West Virginia University, during the 2014 Mental Health Symposium sponsored by Virtual Ability, Inc. in Second Life®. Ms. Matyas (SL name nicki416) is a Thomas Jefferson University student in the Department of Occupational Therapy. The following represents Ms. Matyas’s opinions and insights and we appreciate her sharing them. This lecture addressed how individuals with disabilities may successfully request workplace changes and how, in response to said requests, employers may provide effective accommodations for their employees. The Job Accommodation Network (JAN)( www.askjan.org ) is a cost-free resource that provides individuals with the aid they may need in addressing their rights as employees as well as any questions they have pertaining to the Americans with Disabilities Act (ADA) standards. The recurring theme evident throughout this presentation was encouraging individuals with disabilities to advocate for themselves in seeking out accommodations that would facilitate optimal functioning in the workplace as well as obtaining equal access to the benefits and privileges of employment. Some examples that were given as ways that employers may provide reasonable accommodations to those employees that qualify include changing the physical environment and modifying the way that things are typically done, resulting in equal employment opportunities for all. Specifically, this may present as modifying schedules, restricting standards of performance, or promoting accessibility to various resources. Though a large portion of this process is dependent on the employer and his/her compliance with ADA standards, it is equally the individual’s responsibility to self-advocate and refrain from expecting their employer to merely “read their mind.” Rather, individuals must be knowledgeable about their rights as a potential employee and be sure to sufficiently provide their employers with what their specific limitations and needs are, and how certain adaptations are necessary and will help them to be more productive in the workplace. Something to consider is to include the individual’s medical provider in the employee-employer interaction in seeking accommodations, as a means of giving the employer a better understanding of the underlying medical condition and what the rationale is for certain limitations and problems. Throughout the lecture, Teresa Goddard provided real-life examples of past JAN cases, addressing steps for requesting accommodations and even providing the audience with additional links and articles, such as for helping patients with medical conditions write effective accommodation request letters. Interestingly enough, Teresa Goddard specifically mentioned the role of occupational therapists and other health care professionals in helping to make work environments more conducive to individuals’ performance by utilizing their familiarity with assistive technology and thus making interactions with employers run more smoothly. This portion of the lecture especially stood out to me in that I could relate to understanding the skill set that occupational therapists bring to the table in consulting with individuals with disabilities in seeking employment. Another example that Teresa Goddard provided was the role of ergonomics; that is, adapting the physical environment in order to make it conducive to the individual’s optimal functioning. It is important to note that ergonomic adaptations are not associated with changing the individual’s behavior, but rather, addressing barriers in the environment that may impede performance. These could include addressing the needs of an employee with progressing arthritis, depression, and fatigability, and modifying his/her workspace to allow for energy conservation and increased productivity. Lastly, Teresa Goddard emphasized the importance of monitoring the implementation of any and all adaptations. It is not sufficient to merely implement a change and move on. Rather, it is important to continue to monitor the progress, development, and success of the individual as a means of determining whether the adaptation was effective in helping the individual to achieve their goals and improve their performance in the workplace. This concept is similar to the notion of “client-centeredness,” a primary goal and value for the profession of occupational therapy, in which the individual needs, preferences, and concerns of each client as an individual being should be recognized and considered before, during, and after implementation of any interventions. Conclusively, the ongoing theme throughout this lecture was to ensure that the individual’s voice is being heard, which is both the responsibility of the individual themselves as well as their employer, and the need to be clear on limitations and needs, performance standards and goals, and how reasonable accommodations will ultimately result in success in the workplace. This session ended with an extensive “Q&A” between Teresa Goddard and members of the audience pertaining to their own personal experiences with employment. I found my attendance at this lecture to be very valuable in that it allowed me to compare and apply my knowledge from what I’ve learned thus far in my occupational therapy program to what professionals and researchers as well as “real-life individuals” are dealing with regarding this topic of interest. I hope that individuals continue to advocate for themselves in this realm. The more widely recognized issues in the workplace become, the more progress can be made, and the more equal opportunity may be sought out for individuals with disabilities, who are just as deserving of rights to employment as are individuals who do not have a disability.